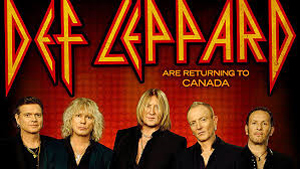 DEF LEPPARD have announced a 13 date Canadian tour in April/May of 2015. The tour will kick off in Penticton, BC on April 15th and wrap in London, ON on May 5th. Tickets for the Canadian dates will go on-sale beginning at 10 AM on Friday, December 12th at LiveNation.com. With 100 million records sold worldwide and two prestigious Diamond Awards to their credit, DEF LEPPARD - Joe Elliott (vocals), Vivian Campbell (guitar), Phil Collen (guitar), Rick "Sav" Savage (bass) and Rick Allen (drums) - continues to be one of the most important forces in rock music. The group’s spectacular live shows, filled with powerful melodic rock anthems, have become synonymous with their name. For the past thirty years the band’s concerts have become must-see events and have quickly made them an institution in the touring industry, as they continue to sell out arenas worldwide. * On sale Saturday, December 13th at 12pm-noon. ** On sale Friday, December 12th at 12pm-noon.